Butler Catholic School Athletic Association held its annual Sports Banquet on Saturday, April 7th to honor all BCS student athletes. The evening began with a welcome from Tom Martin, President of the BCS Athletic Association. 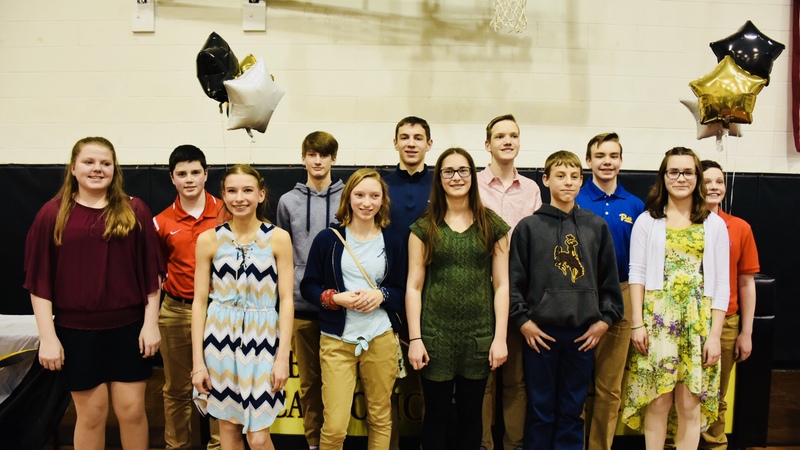 Student athletes were celebrated with a dinner, followed by recognition of one female and one male athlete from each grade, with a special Coach’s Award from each of the five BCS athletic teams; Volleyball, Cross Country, Basketball, Fall and Spring Soccer, and Cross Country. The evening culminated with a presentation of awards to eighth graders, and recognition of the Pastoral Award recipients by Principal Sister John Ann. Congratulations to all our Butler Catholic School athletes! Spring Soccer and Track & Field Awards will be presented at the end of the season.